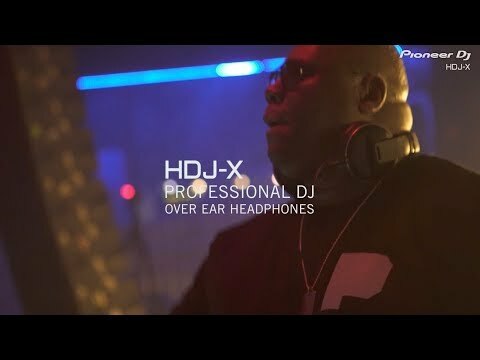 Giving you more volume and better sound in the booth, the Pioneer HDJ-X7 Over-Ear DJ Headphones were designed in conjunction with DJs all over the world to produce a headset of outstanding quality. With their powerful 50mm dynamic drivers, comfortable components and durable build quality, these headphones are an example of the essence of Pioneer's Ethos. The Pioneer HDJ-X7 headphones contain 50-millimetre dome type drivers that can deliver a frequency range from 5 to 30000Hz! This exceeds the human auditory range and ensures absolutely that no detail of your music will be missed. The drivers can also power out a sound pressure level of up to 102dB so that you won't struggle to hear your mixes even in the loudest of clubs. That's not to say that the HDJ-X7's are all brawn and no beauty - yes the drivers are powerful but the level of sound quality is quite simply staggering. Rich yet natural bass, punchy midrange and treble that shimmers will gift your ears without compromise. The Pioneer HDJ-X7 headset was designed to be extremely comfortable because let's face it, they're going to be on your head a long time. The swivel designed cups, padded headband, and plush ear-pads work together to reduce the pressure on your head to the point where if it were not for the stunning sound, you might forget you were wearing them. Comfort may be a paramount feature of the HDJ-X7's but whilst they are comfortable for you, they are hard for the trials they will have to endure being headphones that will be out on the road. A folding design and detachable cable also means they can be easily folded and placed in the included carry pouch for safe storage and transport. The Pioneer HDJ-X7's definitely fall in the 'premium' catagory of headphones and will give your monitoring sound muscle with auditory finesse in a comfortable package.